Alive from J. Warner Wallace on Vimeo. Wallace begins by describing important foundational principles that are necessary for any investigation. He explains the difference between what is possible and what is reasonable, and how investigators get from a list of possible explanations to the most reasonable explanation (abductive reasoning). He takes the reader through the process of abductive reasoning by placing the reader at the scene of a death (quite appropriate, considering the ultimate case to be examined is a death...and resurrection). He starts with the possible explanations and minimal pieces of evidence that all the explanations can account for. He then shows how a detective, by considering more pieces of evidence, gradually removes the reasonableness of the different options until one, that can explain all the pieces of evidence at the scene, remains. This remaining explanation is the most reasonable given all the evidence and without excluding possible explanations before entering the death scene. While more pieces of evidence certainly can be considered, these are the most widely evidenced and agreed upon among both Christian and skeptical scholars who study Jesus' alleged resurrection and the historical context in which it is claimed to have happened. Wallace takes the reader through each option and explains the evidential strength and weaknesses of each option. He shows how considering different pieces of evidence demonstrate the unreasonableness of the options until only one remains that can explain all four pieces of evidence consistently: #7. Wallace explains that unless the investigator excludes the supernatural before even examining the evidence (addressed in his book "God's Crime Scene"), the explanation that the disciples were accurately reporting the resurrection of Jesus is the most reasonable by abductive, evidential standards. He concludes the book by explaining that it is not merely enough to "believe that" Jesus resurrected from the dead but that one must "believe in" Jesus. J. Warner Wallace presents an incredibly easy to understand and engaging case for the Resurrection of Jesus in this book. The book flowed nicely and its length did not take away from Wallace's ability to present the case in a compelling way. The fact that it less massive (literally) makes it a great resource to carry around in your bookbag, vehicle, or on your bookshelf at home, your church, or in the office to give out as conversations about the Resurrection take place. Its less intimidating length is also excellent to give someone who you would like to introduce to the evidence and possibly start conversations with later. 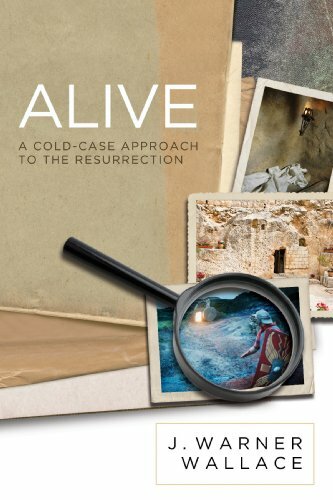 While Wallace did adapt his original "Cold Case Christianity" for kids, Alive is definitely a book that junior high and high school could read and understand, especially if they are more inclined toward non-fiction but the longer books may still be intimidating. Now, what has me quite excited about this book is it is available in a 10-Pack at a reduced price (check that out here)! I read the Kindle edition for this review, but I'll be investing in that 10-Pack deal for my backpack, my home library, and a few gifts. As pastor of a rural church, my desire to feed the flock led me to use Jim Wallace's Alive book to begin. As a tool for Wed. night Bible study, each person received their own copy. We began there & went to Cold Case Christianity. I run bulletin inserts applicable to the lesson we are reading & discussing. Amen! Huge blessing..even in IOWA! Thank you.